When you think about any wedding you attend, one of the first things that you will remember is the food. Was it good? Was there enough? So, just like any happy couple looking to have their wedding in Toronto or the surrounding area, you want the food that you eat on the day to be on point. Many couples will have a very clear idea of what food they want to serve to their guests on their special day, others may need a little guidance. A wedding catering company in Toronto can take care of all of your needs when it comes to the food at your wedding. Having a team of professionals that can handle the high calibre of hors d’oeuvres and entrees that are expected at a wedding is very important to ensuring that your guests feel like they are at the best wedding of the season. Wedding catering in Toronto, Richmond Hill and Vaughan can be adapted to any venue or theme. Receptions held in non traditional places such as large gardens and private properties present no challenge at all for an experienced team of wedding catering specialists. All couples that are planning their wedding will want to make sure that everything to do with the wedding catering goes as smoothly as possible and that each element complements the overall theme. For example, you would not want hot dogs served with a formal dinner. While this difference is extreme and obvious, an experienced catering team will be able to make some very good recommendations based on the venue, theme and even the time of year. The season will determine what sort of welcome cocktail and food will be recommended, of course it is up to the happy couple to make the final decision. However, there are some things that should be thought about carefully, a Toronto wedding catering specialist will be able to spend a great deal of time with you discussing all of the finer points of matching the theme of your wedding to the setting. One thing to remember though, it is your big day so what you say goes! If you have any specific requests or anything special that you would like to include in the menu, make sure that you speak up so that the accommodation can be made. 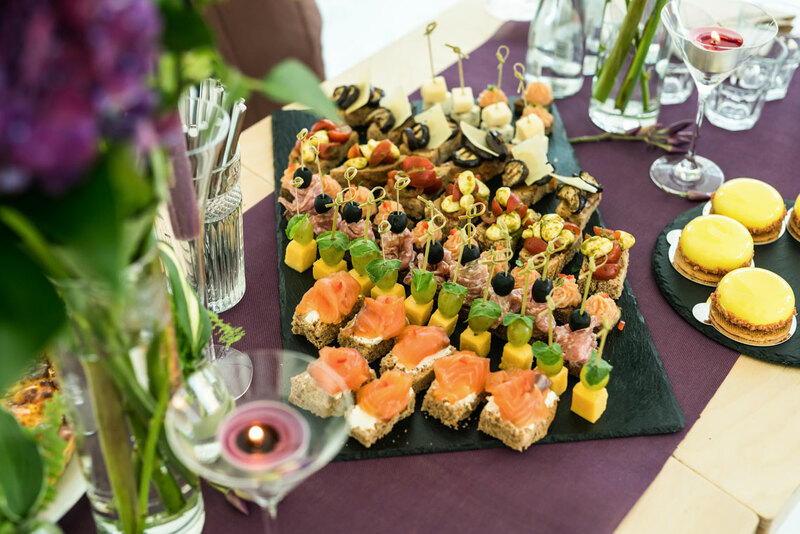 When choosing a wedding catering service, you want to be sure that they are experienced at not only providing the best food on your wedding day, but that they can work together with wedding planners well. Clear lines of communication between the wedding catering service and any third party planner and/or venue is essential to making sure that there are no logistical challenges on the wedding day itself. This could be anything from ensuring that their is adequate kitchen space to do any meal prep to dedicated space for the unloading of food and equipment. Having a wedding catering service in Toronto, Richmond Hill or Vaughan take the burden of providing the food at your wedding can make a huge difference to the amount of work you have to do as you plan the big day. You can also be sure that there will be no surprises, as wedding caterers are professionals with many years of experience. Having this weight off your mind can allow you to focus on other equally important aspects of the wedding such as the seating chart, shuttle service to and from the hotel and everything else that needs to be in place for you to have the perfect wedding.